I decided it was about a time that I'll dismiss my prejudices towards social media for good, considering how everyone and their dog has a Facebook and Twitter account these days. Long story short, I set up an page on FB for Project Phantom and and a Twitter account. So yeah, without further babbling, Project Phantom can now be found on Facebook and I also set up a Twitter account for posting small mod updates and other assorted content that I'd like to share. There is also PP YouTube Channel, but that's currently empty of content (as I didn't want to re-upload the outdated content when I revamped the channel), something that will hopefully change with next progress/media update. Mod progress has been slightly slow lately, university work, been ill for a bit. Oh, and my computer graphics card fan kind of canceled it's contract a while ago, and the only reason this machine can even run at all without graphics card overheating is due to a makeshift life support solution of sorts. Repairing the fan is kinda out of question due to circumstances, will probably be trying to purchase a new machine in near future instead of spending any more cash on an already vastly outdated setup. 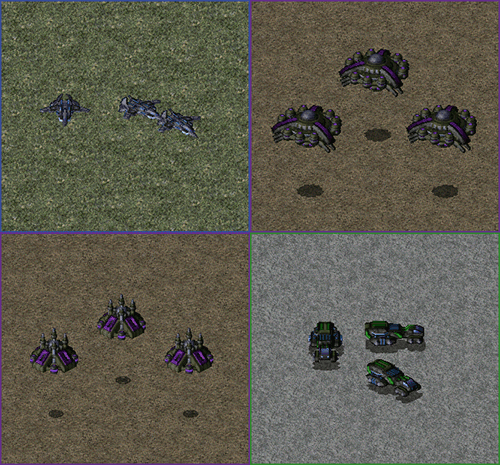 Here's a little picture of some new & graphically overhauled units, taken from Project Phantom ModDB image gallery. Bottom two are just graphical revamps, the other two are more interesting additions. Not gonna spoil what they are or what they do yet, maybe you'll see in next actual media/progress update. Click on the image to view it in a full size. That's all for this time, folks. Edited by Starkku, 05 April 2016 - 01:09 PM. Woot Dominion reinforcements from Mars.